If you read the papers or blogs throughout New York this morning, you might think it's the 1980's. A New York team has made a managerial change, this time at 3:15 am via e-mail. In the single worst kept secret in baseball, Willie Randolph, pitching coach Rick Peterson and first base coach (because we all know the first base coach makes a big difference) Tom Nieto were fired this morning and were replaced by Jerry Manuel, Don Warthen, and Ken Oberkfell, respectively. You would think George Steinbrenner was running this team wearing a turtle neck in June. What's next for the Mets, private investigators following David Wright and Carlos Beltran? Trading Jose Reyes for Richie Sexson? 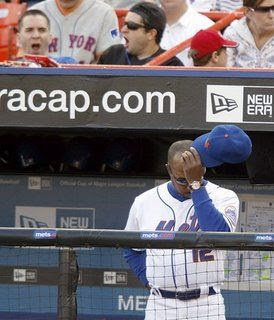 Good lord, this is a sad day to be a Mets fan. If the Mets were going to fire Randolph due to last year's collapse they should have done it this offseason, not in June after a win on the first game of a West Coast road trip. They have now, instead of containing the damage to one season, let it spill over to season two. What a way to open Citi Field.